In a development offering hope to slain hero cops everywhere, Arizona boffins have wired up sensors to a living brain, then connected the hookups to a machine body hugely more powerful than the brain's own. The moth in its enhanced machine body. We're not quite talking Robocop yet, however. Rather than using a brain from the shattered body of a courageous copper, Professor Charles Higgins and his colleagues (including the superbly named Vivek Pant) have chosen for the nonce to use the brain of a moth, still mounted in its moth body. 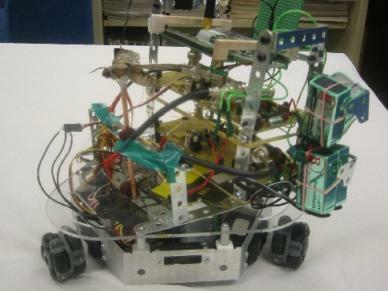 Scientists have built a robot guided by the brain and eyes of a moth. The moth, immobilised inside a plastic tube, was mounted on a six inch tall wheeled robot. It seems the "Robo-Moth" was exhibited this week at the annual shindig of the Society for Neuroscience in San Diego. The moth in question was a tobacco hornworm, chosen by Prof Higgins for the simple reason that his University has a whole bunch of them for other research. The tobacco hornworm moth devours crops and is regarded as a pest. It has a four-inch wingspan, apparently, and is often mistaken for a bird. Or a small, hungry, crop-devouring robot, as we have here. The professor has more ambitious plans, including the cybernetic enhancement of house flies and dragonflies. For the moment, the robots to be controlled by the insects are relatively non-threatening, apparently unarmed, unable to fly, and powered by nothing more puissant than PP3 batteries. We just hope to God that Higgins, Pant, and the crew don't get in touch with the Pentagon and their various operations involving brain-chipped cyborg moths, robot helicopter gunships, and missile-firing droid planes which reap humans like corn.